Most adults will agree that teaching kids about money is more important than ever. Those of us who didn’t get much financial education before we joined the working world often wish we could go back and do it all over again. But we also remember that financial education was not the most thrilling aspect of our childhood. Even though our parents explained the concept of saving money in order to afford the things we wanted, our eyes glazed over whenever complicated abbreviations and percentages were mentioned, then we just got confused about what it all meant. Financial education is an essential part of adulthood, but it’s not the most engaging topic for some young adults, let alone small children. There are many tools at hand to help parents teach their children about financial responsibility, especially debt and lending since the next generation is just as likely as the Millennial generation to enter the working world with a huge amount of debt from student loans. Being open about your own finances to set an example, helping them build a budget from their savings, and explaining the difference between good and bad debts are just some of the ways you can teach children about money. However, to make it a little more engaging for young children, you can use games to make finances fun, yet still teach them practical lessons that will serve them well when they reach adulthood. Here are just a few board games that were created specifically to teach children financial responsibility. Most parents – and people with siblings – will recognise Monopoly as the game that started off amicably, but would soon descend into chaos and cause family feuds over Christmas or Thanksgiving. The earliest known version of Monopoly, known as The Landlord’s Game, was designed by an American, Elizabeth Magie, and first patented in 1904 but existed as early as 1902. Magie, originally intended The Landlord’s Game to illustrate the economic consequences rent, and the concepts of economic privilege and land value taxation. When it first appeared in the 1930s, it had been significantly simplified and Monopoly was simply intended to teach children about paying rent, buying property, and how unexpected circumstances could suddenly lead to financial trouble. It even teaches children about some of the real-life options available to them to get out of debt, such as borrowing money from the banker, or mortgaging one of their properties until they next pass Go and collect $200. Monopoly teaches players money management and the impact of financial and investment choices and situations. Most importantly, it teaches children that life is unpredictable and not always fair, but you still have to pay the banker. For parents looking for a game that can give an accurate representation of life and the effects your decisions have on finances, The Game Of Life is as close as anyone can get. This game teaches children the effect of education and career choices on income, the impact of taxes, the importance of early investing, and even the cost of compound interest and loan payments. It does everything except teach kids about debt consolidation, but more complex explanations can be found at DebtConsolidationUSA.com, or any other financial websites. What sets The Game Of Life apart from Monopoly, is that it stimulates a person’s travels through his or her life, from college to retirement, with jobs, marriage, and possible children along the way. Unlike Monopoly, which starts everyone off on an even footing, The Game Of Life can show children that even the choices they’ve made in their early years can have long-reaching consequences into adulthood. Therefore, it subtly explains why they’re receiving a financial education even though they won’t have to worry about bills and credit for several more years. As a result, they might be more willing to pay attention the next time you sit down with them to discuss the family budget. It’s never too early to teach kids about the excitement and anticipation of payday; even most adults celebrate this day with the enthusiasm of a public holiday. As a board game, Payday is not too different from Monopoly and The Game Of Life. The player with the most money wins, kids learn about paying bills and dealing with unexpected expenses, and surviving the game until you get more money. The difference is that the board is set up like a 31 day calendar, and the players move through the month dealing with the new situations that each day brings. It does capture the sensation of feeling financially secure one week, then having to tighten your belt overnight because of an unexpected bill. The month is full of financial bonuses, such as winning the lottery, and financial pitfalls, such as extra bills or bad investments. While in Game Of Life the players can almost pinpoint the decisions that led to their financial situation, Payday emphasises the random side of financial responsibility – even when you do everything right, sometimes things happen that can either boost your savings or drain them altogether. Games like Monopoly, Payday, and The Game Of Life are all useful tools for teaching kids about money, but their major flaw is that they were introduced back in the 20th century, when finances were a little different for new graduates. Charge Large was designed in 2007 by two young entrepreneurs, and it was released by Hasbro in 2009, making it the most recent financial-themed board game for children. This is one of the few games out there that specifically teaches children about credit cards and the importance of building good credit. The players start out by receiving a gold credit card and must strive to upgrade to the elusive black credit card. However, the winner must also have no debt and $2,500 in cash, which challenges players to manage credit responsibly while they navigate the board and build wealth. Not all credit is bad; children will soon learn that they need good credit to qualify for a mortgage, to pay for a car, or just to get a good rate on a loan if they need funds to further their career. But they will also learn that bad credit can leave them in difficult positions. By playing Charge Large, children can learn that responsible credit use builds your credit rating, giving access to higher credit limits, but that racking up credit debt without saving and investing can create a financial disaster. It’s more engaging than looking up a Bankrate.com article about building good credit. The sooner they accept that a credit card is an essential tool for building credit, and to use it wisely, the better their chances for starting their adult lives with a good credit history. There is a great article at Creditcards.com which explores how children can benefit from being taught about money from an early age. No matter how mature your children are, not all of them are old enough to be thinking about credit cards and decision-making. Their only appeal for playing Monopoly or The Game Of Life is to crush all their opponents and win the most money – they’re probably the cause of most of the feuds. To get them to really think about money as a tangible thing, instead of just a toy in a game, start them off with The Allowance Game. This is a perfect game for younger children, or those with short attention spans. The goal is smaller – only $20 – but it does get kids thinking about the value of $1. It also teaches them about budgeting, and that, although money can buy a lot of things, money eventually runs out. Most importantly, it will make them think about where they want to spend their money; is it better to spend it all in one place, or to save as much as possible? On a more practical note, The Allowance Game teaches your children the benefits of completing their chores, and the penalties that come with forgetting to complete their assignments. As the kids play, they earn money when they land on spaces that say “mow the lawn” or “walk the dog.” It then teaches responsibility with scenarios such as “I forgot to do my homework,” which causes the player to lose a turn. It even touches slightly on unexpected bills, because they see just how quickly their hard-earned money can go when they’re forced to spend some of it buying a gift or paying for an overdue library book. Instead of letting them play at being grown-ups, The Allowance Game teaches younger children about money in an environment that relates to them, making the lessons feel more relevant. 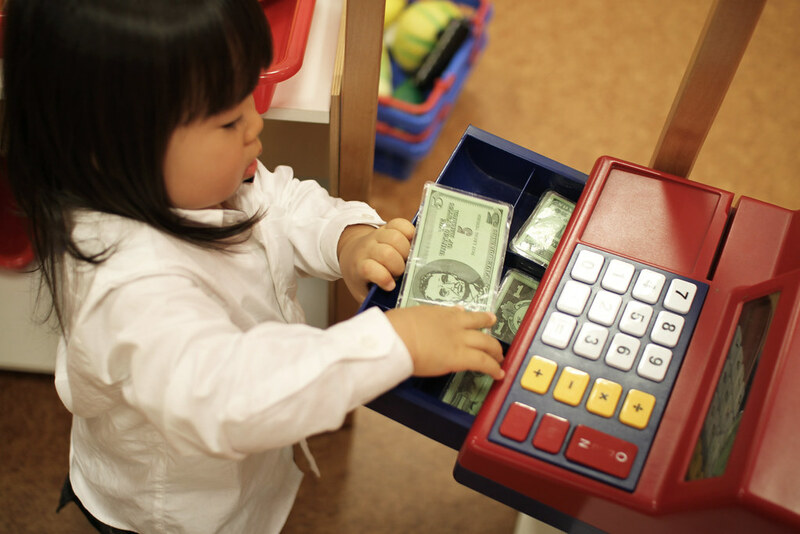 Teaching kids how to handle money doesn’t have to be boring and full of complicated figures. These games are just a few examples of the wide range of educational tools out there that parents can use to simulate real life financial situations. While some games, like Puerto Rico, might feel more like a historical simulation where your children can pretend to be colonists, it still teaches them the basic concepts of setting up a business. Kids learn while they have fun, and money is definitely something they need to learn. 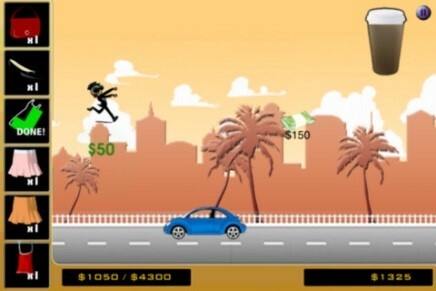 Learning Through Play: Can mobile games really teach children about money? Children are increasingly using electronic devices to access games (much to the dismay of their parents’ wallets) but can these games ever teach them useful skills? We decided to put some apps to the test. Our test focused on two main criteria: educational content and playability. A good play experience was very important to us because even if a game contains a wealth of academic information it will lie untouched if it fails to entertain the player. Find our results below. The Apple Store description for Struct confidently claims that this building game will prove that ‘financial fun isn’t an oxymoron’. But whilst the game may be fun, we can see little evidence that it teaches much finance at all. The concept is much like Tetris, in that you aim to place different coloured blocks in the optimum position to build a tower block. 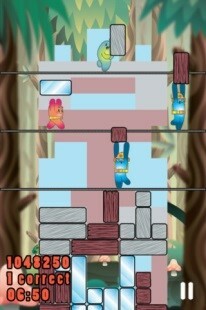 The financial angle comes in through the characters and materials the player uses, all of which are supposed to resemble a financial product. So steel is ‘a bit like cash investments… slow to build but always there’, whilst glass is linked to stock investments (which require greater care and are liable to break). This is a clever concept, but fails to take account of the fact that very few children take the time to read through instructions before starting a game. The vast majority are likely to start clicking and learn the rules as they go along. The game itself relies on no financial knowledge, so it is only by reading through the glossary and material index that any information is likely to be learnt. If parents are willing to sit down with their child and use the game as a spring board to discuss investments the app could be useful, and the game is certainly addictive. But it is sadly not as educational as it purports to be. The financial learning in Celebrity Calamity is happily much more integrated. The player becomes a personal assistant to three demanding celebs (a concept that will appeal to many star-obsessed youngsters). Their role is to run errands for the celeb, decide which jobs they’ll take, and make sure their bank accounts stay in the black. Rack up late payments and your celeb will get angry, accumulate too many debts and you’ll be fired. The mini games are entertaining and tricky enough to maintain interest, although we found the lack of reward for completing the game slightly disappointing. The concept of sensible spending is very neatly taught, and celebrity displays of overindulgence effectively discourage impulse spending (get ready for cries of frustration when your celeb tells you she just brought a new bike for 15,000 – sending you way over your credit card limit of 10,000). As with Struct, players of Celebrity Calamity would still benefit from adult participation, particularly younger players who are less familiar with the concepts of credit and debit. But overall, this is a well-designed app and since you can currently download it for free, it is well worth a look. This colourful app does pretty much what it says on the tin: it’s a combination of maths and bingo. Equations appear at the top of the page and players tap the answer on the bingo card below. There are three difficulty levels, and upon completion you are given a new bug to add to your collection, which encourages further play as your child tries to collect them all. Unfortunately the app doesn’t teach any maths, so a certain level of proficiency is necessary before purchase, but the game did prove to be an engaging practise tool and will help learning through repetition. Long-term playability is probably limited, but can be improved by engaging several children in play since the leader board encourages healthy competition. The number of financial or money games on the market is still rather limited and the apps we tested demonstrate why: it is hard to develop a truly engaging game which teaches money skills whilst still feeling like a game. Apps like Struct are an example of developers with great ideas just missing the mark. Which is why we were pleased to come across Celebrity Calamity, which is closer to balancing the educational and game elements, exhibiting the addictive appeal of a game whilst also being firmed rooted in financial knowledge. Celebs proves that apps can teach kids about money, and those apps that get it right can be hugely effective (as we know here at The Financial Fairy Tales learning through enjoyment is one of the best ways to learn). We just need more of them! So, to any aspiring game designers out there: get working on it! And in the meantime, please use the comments and share with us any of the games and apps you’ve found which are particularly good at making learning fun. I’ve recently got hold of the Thrive Time game from Sharon Lechter’s company Pay Your Family First. In this reality based board game, the players are teens starting in high school with part time jobs. they then will be faced with money and life decisions like buying cars, managing expenses, giving back to their community, paying for further education, using credit cards, buying stocks and shares and perhaps starting businesses. The Video below shows the game in action in the US. We are planning a trial here in a local school shortly and will post a full evaluation. You are currently browsing the archives for the educational games category.